Started with a Linux Mint 17.1 (Rebecca) system such that 4GB is reserved for swap and Mint occupied 23GB, leaving 24GB available for Xubuntu. I booted into the thumb drive desktop. I successfully installed Xubuntu 14.04.2 from the ICON on the desktop. When I went to reboot, Xubuntu hung. During the hand, I was able to Ctrl-Alt-F1 and attempt a reboot there. This resulted in a report of "I/O error". Attached you should find a compressed tar archive of some logs, including the /var/log/installer directory. 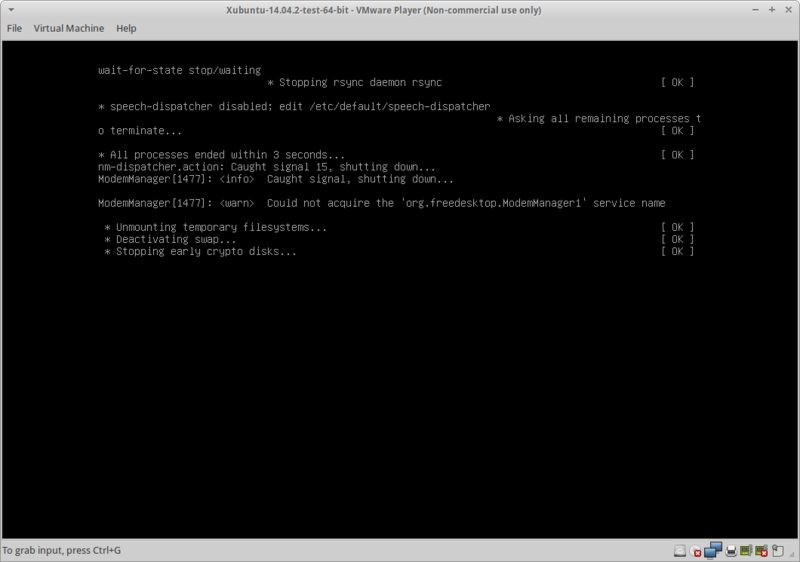 I'm getting the same problem with a Installation under VMware Player 6.0.5. After a successful installation (installing packages and updates over the internet) the installer hangs on the reboot. Can you be more specific about this IO error? Instead of trying to shutdown, can you run `dmesg` and see if there were any recent IO errors and exactly what they were? "IO error" is what was displayed. There were no observable I/O errors on the display. The compressed tar file has the /var/log/installation directory. There are a lot of other logs in that archive. It sounds like you want me to repeat the install-along-side type of installation and collect a dmesg log. Yes? Collect anything else at the point of the hang? I don't see anything out of the ordinary in the logs so my only guess is that whatever error happened caused the disk to go read-only so the logs could not be written, thus the only way to find out what went wrong is to run dmesg and look. BTW: VMware Player runs stable and after a "hard reset" with Virtual machine->Power->reset guest, the system comes up in a clean state. :-) I'll attach log and configuration files. I was determined to get the whole contents of /var/log using Ctrl-Alt-F1 when I reproduced a hang the second time. Strangely enough, the reboot-hang did not happen the 2nd time. So, I backed off and tried a 3rd time and the reboot proceeded as expected. All 3 times, I used the same preexisting Linux Mint 17.1 (Rebecca) installed partition and swap partition as a starting point and the exact same thumb drive contents of Xubuntu 14.04.2. Note that this consumed a lot of time but it is worth it from my own experience as a recipient of bug reports. In the interest of everyone's time, I'll close this as unreproducible. If Daniel Mehrman can reproduce his observations consistently, I suggest that he reopen this bug report or create a new one. On second thought, "incomplete", as it is defined on launchpad, seems to be correct. I can repeat this bug with different machines, but on the other hand it's just a virtual software and there is no warranty that this could be a VMware Player bug. So long no other people reporting a VMware "problem", we can close this ticket so far. Well, with the latest iso version (20150218.1) the problem is gone and everything runs smoothy now.